After last night's game action, the second round is set in the West. Toronto will play Grand Rapids, and Texas will face off against the Oklahoma City Barons. 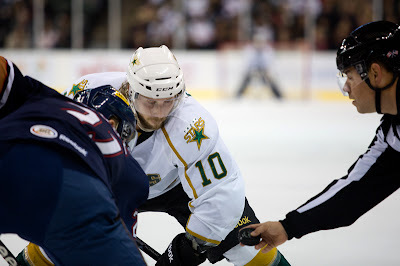 The Stars had a 4-7-0-1 record against the Barons this season. Games will start with home dates for Texas this weekend May 9th and 11th then shift to OKC for three. In a bit of a curiousity, the Stars and Barons will not have the opportunity for morning skate on Saturday due to University of Phoenix graduation ceremonies taking place at the Cedar Park Center that morning. Also interestingly, the Barons will not have a chance to host a weekend game in the series. That could work in Texas' favor as attendance has been weak in OKC even during the weekend games. There are certainly other advantages to being at home, but the crowd can't be dismissed. The Cox Convention Center holds 13,399 for hockey but only hosted 2,043 and 1,990 fans respsecitvely for Games 1 and 2 of their opening series against Charlotte. Obviously we'll preview the series here more as the week goes on. The Stars will have a very different task on their hands from the first round. Milwaukee was a grind it out defensive club. The Barons are not, with the average margin of victory for either team in their first round games being four goals. OKC is such a weird hockey case, they averaged 6500 their last year in the CHL but and it was that low only that year (I assume there was a reason) but the previous 17 or so years averaged over 8500 or so. I don't know alot of OKC fans but I know a large number of Icebat fans despise the Stars, I wonder if those 8500 OKC Blazer fans are the same. I've always believed the Stars should do some kind of tie in between the two teams (Icebats and Stars)to bring in some of the Icebat fans. Have like a Austin hockey history wall, stuff like the "STP" fuel line, who's three members scored 97, 96 and 85 points. Our goaltender Brian McMullen having a stick in the hockey hall of fame for scoring a goal. Truth is they could of bought the Icebat name for a song if they wanted, which I would of preferred. I went to see the Stars play in OkC during the lockout when the Barons had Eberle, Schultz, Hall & Nugent-Hopkins and I was shocked at the lack of support. I got 2nd row tickets behind the visitors bench an hour before the game, and the attendance was less than an Allen Americans game. The atmosphere was far less intense as well. OKC's series with Charlotte averaged over 7 goals per game. OKC's season-series with Texas averaged over 6 goals per game. Get ready for some exciting high-scoring action in Round 2. I don't think that attendance matters in OKC with regard to how well or poorly they play. If anything, they're used to playing in front of nobody in one of the worst hockey barns in the league. On the other hand, it might be something of a let-down for other teams to go there and instead of feeding off the playoff intensity in the stands, they're lulled into narcosis by 12,000 empty seats. I went to 3 games in OKC and would not go back. Besides the low attendance and annoying mascots, their PA system is SO overly loud that you can't understand what they're saying and it is actually painful to your ears and head. The two bright spots were the "high intensity ice girls" who were figure skaters and skated during the intermissions and the great souvenir shop.